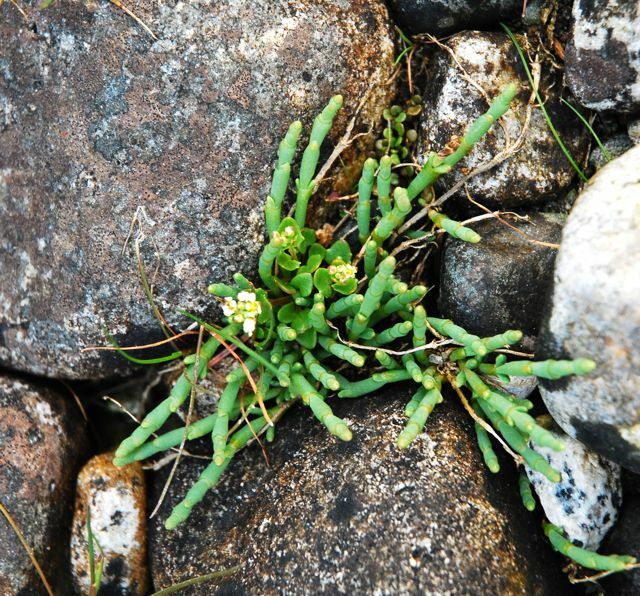 Sea asparagus on the shorelines of Calvert Island. Photos by Yuhei Iida (top left), Kelly Fretwell (bottom left), Elizabeth Bailey (top right), and Thalia Christou (bottom right). Note the joints on the stems in the bottom right photo. This species is a low-lying, fleshy perennial. Its trailing, jointed stems reach 1 m long, and grow from long rhizomes. Flowering stems branch off from the main stem often, and grow upright for 5-30 cm. The flowering stems are often a brown-purple colour, and end in 1-4 cm long knobbly 'spikes'. The flowers are sunken into joint hollows on these spikes. The leaves are present only as very small opposite scales. 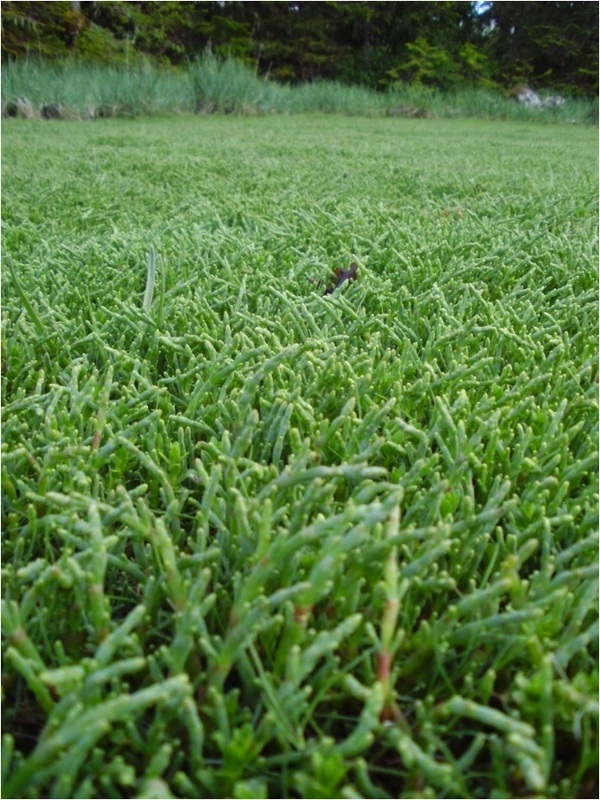 Sea asparagus is found along shorelines, salt marshes, and tidal flats without strong wave action. It is a common coastal species, and occurs all along the west coast of North America from southeastern Alaska to Mexico. It is also found along the eastern coast of North America and the Gulf of Mexico. 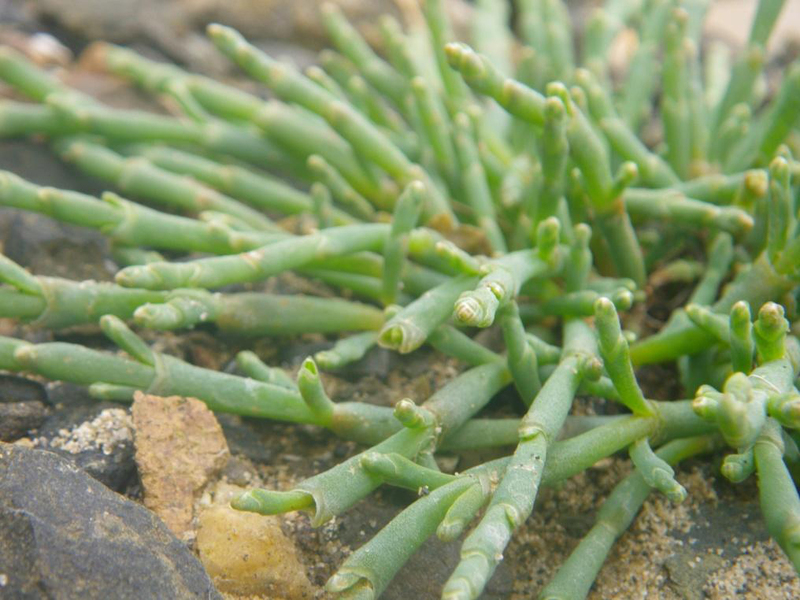 Seablite, also known as maritime or slender glasswort (Salicornia depressa), is a similar-looking species that grows in similar coastal areas. It is taprooted, with more upright branches growing from an upright stem. Sea asparagus is edible and is sold in some stores, particularly seafood, local food, or specialty stores. It is picked wild and often pickled. It has a salty taste, and can be cooked in a variety of ways. Click here to see some sea asparagus recipes. 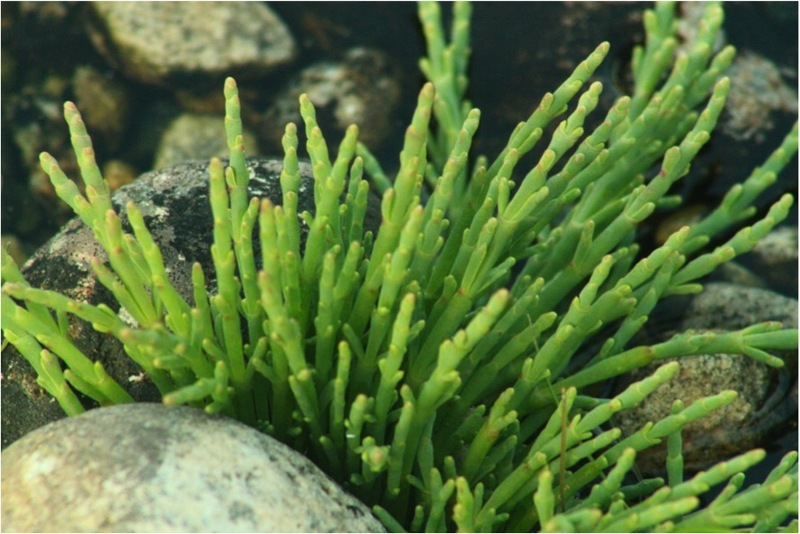 The name 'glasswort' comes from its previous use as a source of alkali for glass-making. Pojar, J. and MacKinnon, A. (1994). Plants of Coastal British Columbia. Vancouver, BC: Lone Pine Publishing. P. 310. Sarcocornia pacifica (Standley) A. J. Scott. In Klinkenberg, Brian. (Ed.). E-Flora BC: Electronic Atlas of the Plants of British Columbia. Lab for Advanced Spatial Analysis, Department of Geography, University of British Columbia, Vancouver. Accessed on 13/08/2013.